Today we celebrate Wellbeing Day in Coolmine CS. This is a day filled with activities to raise awareness of Wellbeing in our school and to remind us that we need to take time out to stay active and connected. Students will be offered the opportunity to enjoy music in the library, take part in an art activity, take a walk or have tea and chat with teachers and classmates. To help make sure everyone –students, parents, and teachers – has a common understanding of what wellbeing means, six indicators describe what is important for young people’s wellbeing. These indicators are not seen as goals or targets to be reached. The journey towards wellbeing is never complete and will always involve ups and downs. Often it is through dealing with obstacles and set-backs that people grow. 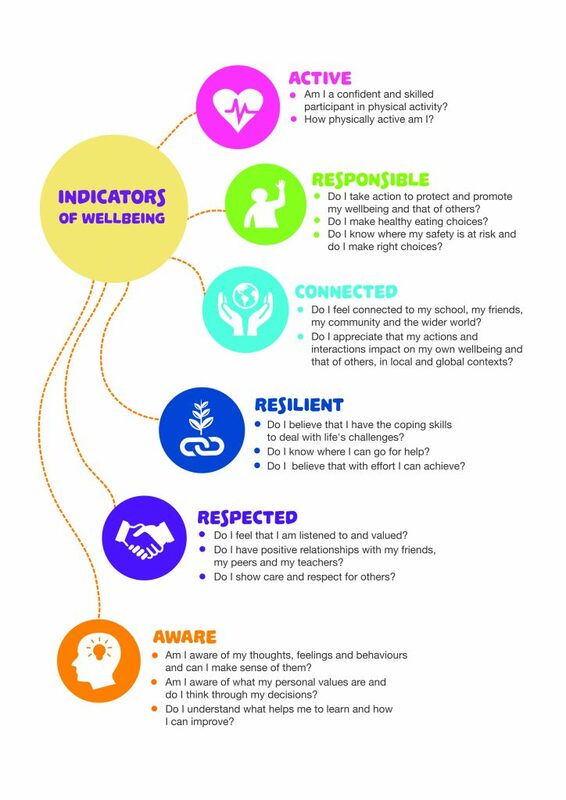 The wellbeing indicators make it easier for everyone to have conversations about student wellbeing and may help identify where a student is in need of support. The indicators of wellbeing are: Active, Responsible, Connected, Resilient, Respected, Aware.